It’s the official beginning of spring which means the warm days of sunshine aren’t too far away. On a nice sunny day it is hard to find me anywhere but outside and one of my favorite spots to put my feet up and take in the sun is around my parents’ pool. 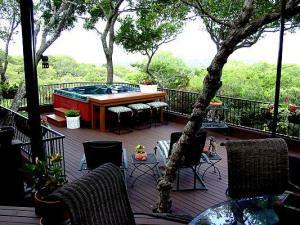 They have a great pool deck that is a great place to spend some time outdoors. 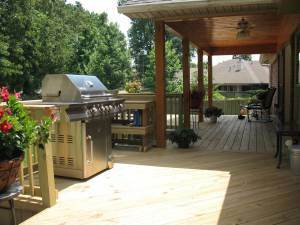 This first design is from our deck builder in Charlotte. 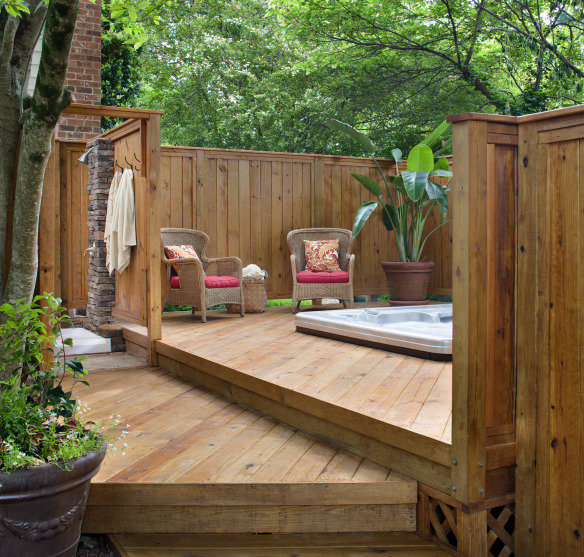 The homeowners have a large backyard, but they wanted a mini sanctuary for their hot tub and outdoor shower that was private. They essentially wanted a room outdoors. Our designer designed a space that was beautiful, private and safe. 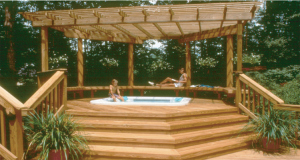 The biggest issue when designing a spa deck is the weight of the spa. The weight of the tub, as well as the water needs to be accounted for to make sure the structure is safe for everyone using it. Additional foundation may be needed underneath to ensure there is no sinking. 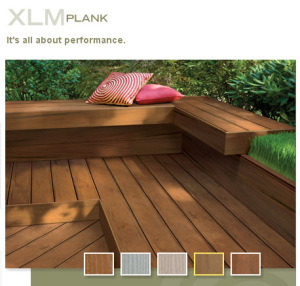 Our Archadeck of Charlotte team designed the space with this beautiful wood in mind. 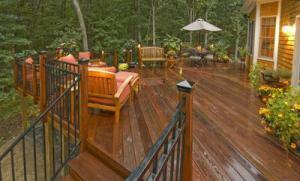 The wood decking for the deck and fence gives the area a spa like feel that I would love to relax in. 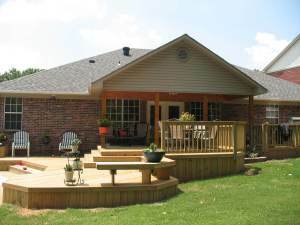 This pool deck in the Tri-Cities is on a large, rural property. The homeowners had an above ground pool that they weren’t getting enough use out of. 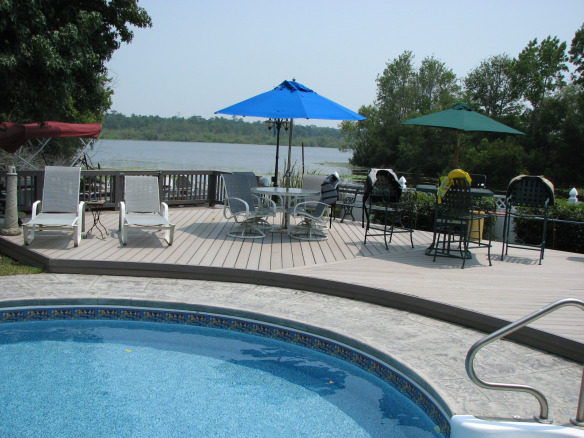 They thought that having a deck built at the pool’s height would make the area more inviting. Our Archadeck designer decided to build a pool deck that had enough room for several lounge chairs and a slide for the kids. 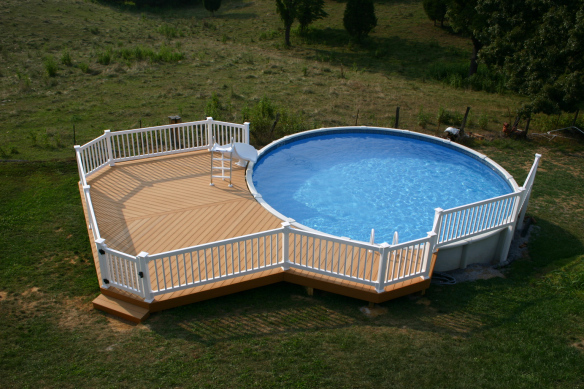 Because the homeowners had young kids that they wanted to keep away from the pool at times, the entire space was fenced in using vinyl deck railing. The only way to climb into the pool is off the deck. I wouldn’t mind having this view from this pool deck in Charleston. This commercial area in South Carolina has a small in-ground pool and beautiful view, but until recently didn’t have the outdoor structure needed to pull it all together. The property owners wanted a space that visitors could sit and relax or dine on while enjoying the view and the pool. 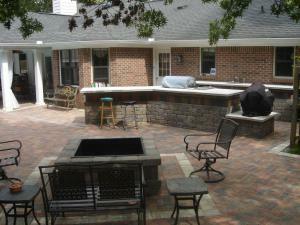 The pool already had pavers surrounding it and the Charleston deck designer was able to create a smooth transition from one space to another by adding a step onto the pool deck. 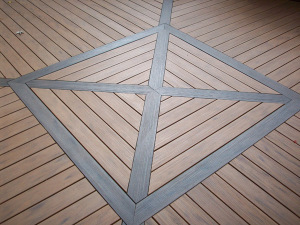 The grey TimberTech decking complements the grey tones of the pavers beautifully. 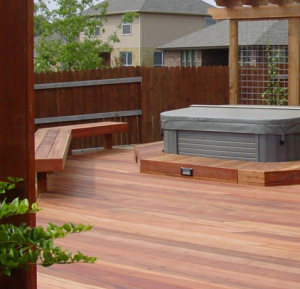 This last pool deck comes from Austin, TX. The homeowners built a beautiful pool and spa area in their backyard that had a unique shape and wanted the new pool deck to mirror its curves. 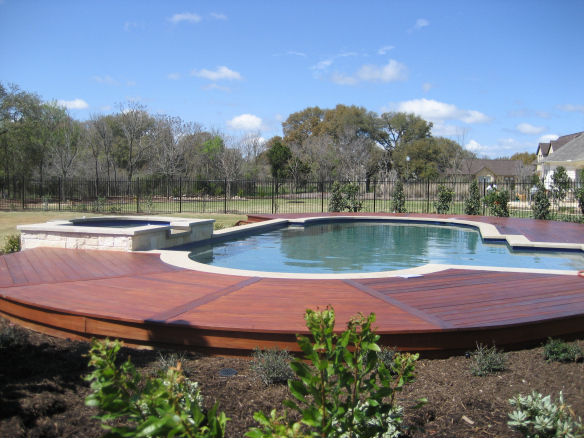 Our Archadeck of Austin team designed a low to grade curved deck to surround the pool on three sides. 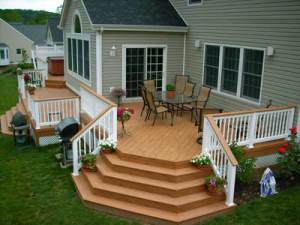 By making the deck low to grade, the deck was not only at the same height as the pool, but no railings were necessary for safety. 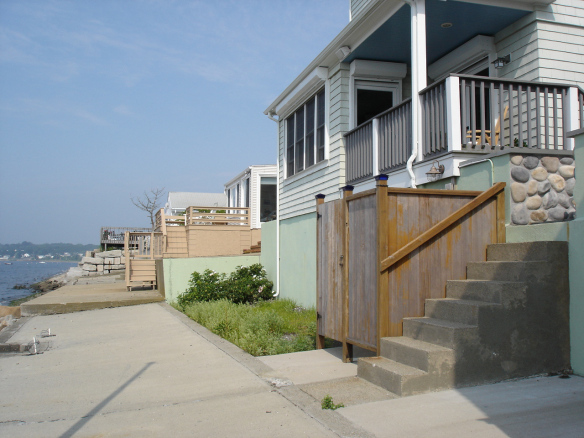 The designer and homeowners agreed that adding railing would make the space more cut off from the rest of the property and obscure the views. 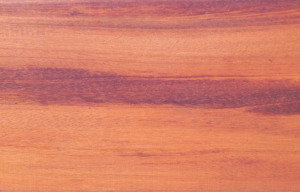 I love the deep red color of the wood; with the spaces more natural surroundings, it goes with the more earthy feel of the space. 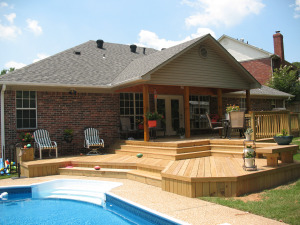 Pool decks are a great way to make a pool the center of an outdoor area. They make the space more welcoming to the homeowners and their guests. 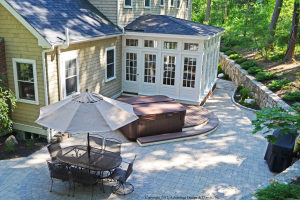 If you have an unfinished pool area or your current one needs an update, contact your local Archadeck Outdoor Living office. 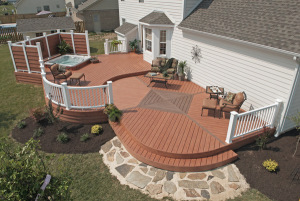 Our trained deck designers will make sure to create a space you love. 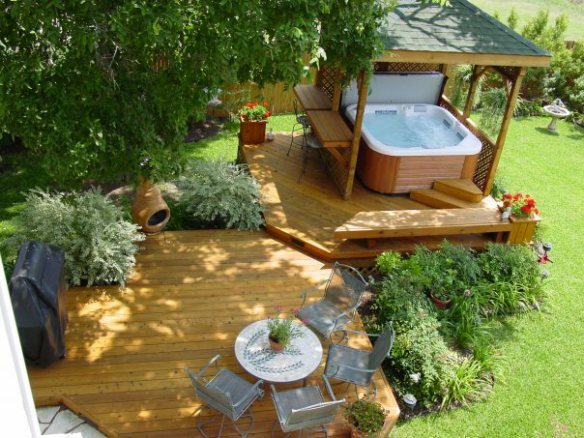 Some key considerations to remember when you make the choice to build a hot tub or spa deck are you want the hot tub or spa to be where it is 18" above the deck and not flush to the deck so you will be able to sit on the sides and swing around when necessary. 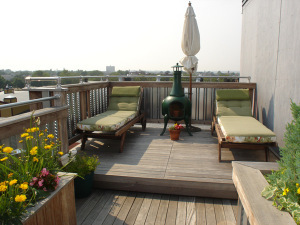 You also want to ensure you can enter and exit the deck from all sides with adequate walk-around room at a minimum of 4 feet , by having 6 feet you will have room for bench seating to sit down and remove your shoes, etc. 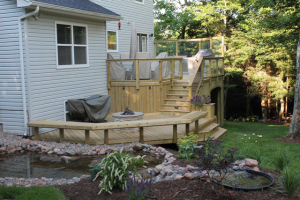 Another key element in good spa deck design is never place your spa deck under a window because it will become an eyesore when looking out from the interior of your home. 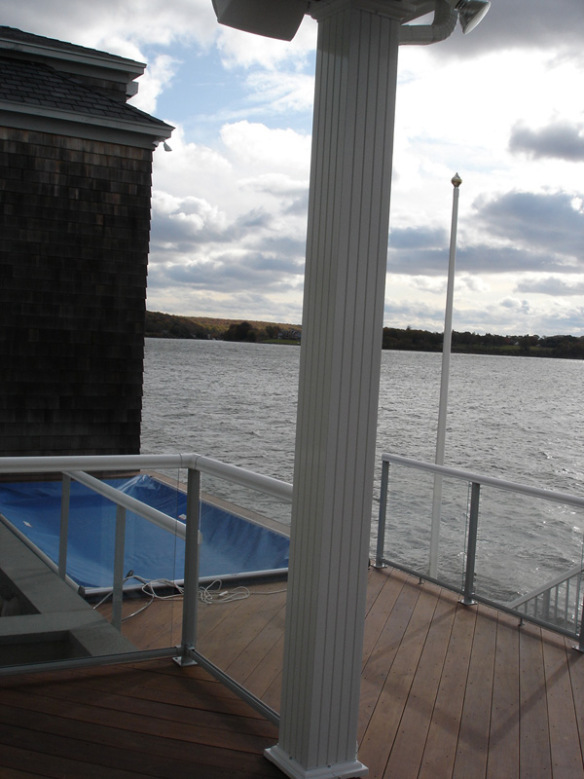 Susan Lee at Archadeck of Rhode Island certainly had her work cut out for her when creating a custom deck overlooking the water that had an “endless” feel and also an “endless” pool spa. 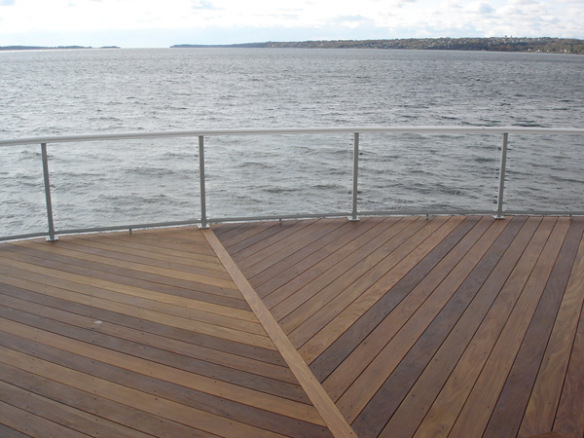 From the deck, the owners wanted to make it look as if the deck actually ended over the water. They also wanted the pool spa to look as if it ended or blended into the water. It’s tougher to see from this elevation and since the spa/pool is covered how it looks endless but from that elevation, you get the same great endless feel that you do from the deck photo above. The endless design effect in creating this design were a small challenge in comparison to the challenges presented when building the deck. 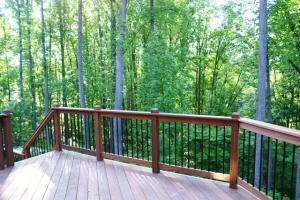 Here is a look from below from before the deck was built. Here were some of the challenges. Archadeck could not put any footings in the concrete walkway which was a difficult design because it cantilevers 6’. So they worked with a local engineer and the building inspector to come up with a structure that met their needs. 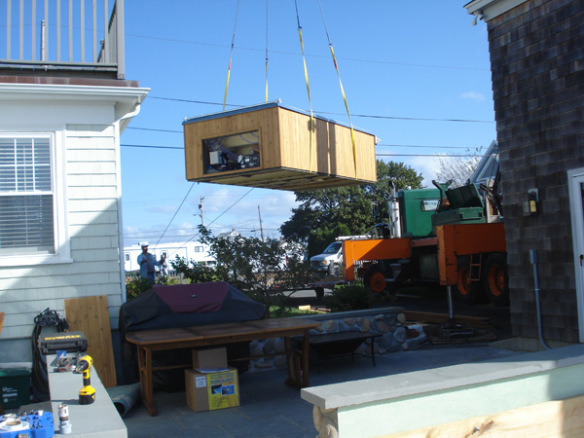 The next architectural challenge was creating a crib for the pool spa which meant building a concrete crib for it to sit on and using a crane to lift it from the driveway to the deck. Here they are using the crane to place the concrete pool crib. What was nice is that the look from below was only enhanced by the beautiful stairs and lattice finish work that was done. Last but not least is one of the final critical components of Archadeck projects – selecting the best quality, best fit products for the job. Archadeck partners with many product companies to ensure the products used live up to the quality of the design and stand the test of time. 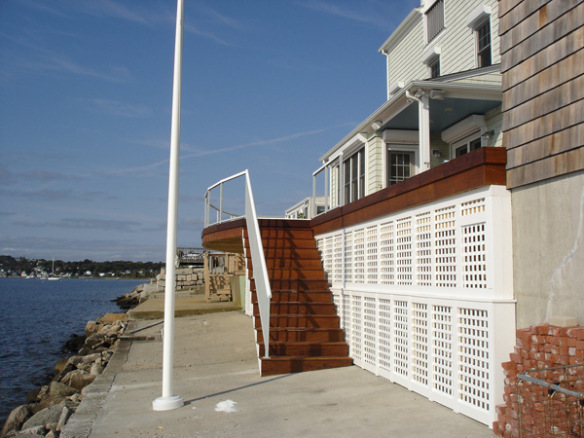 The decking is Ipe with Versatex Trim and Permalatt 3-D Lattice and DuraDeck Aluminum Railing. 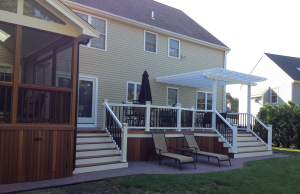 For these Portsmouth RI owners, their new deck adds the magic and maximizes their entertaining opportunities for their summer home. 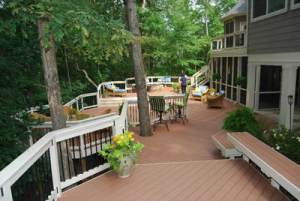 They love the deck and enjoy their endless pool daily. The owners were great to work with and thankful that we as Archadeck were able to pull it off with the help of the drafting department and our great crew. 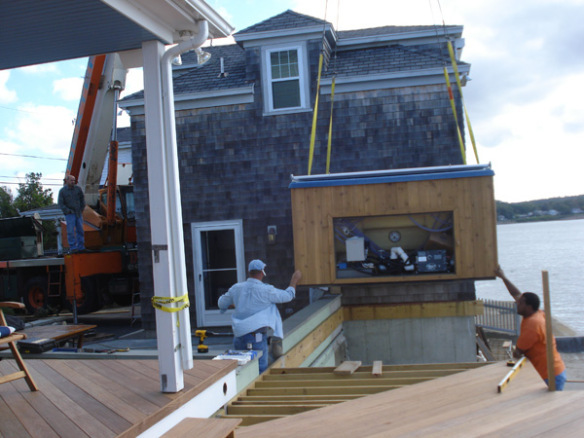 To contact Susan Lee at Archadeck of West Rhode Island, call (401) 397 – 6927.